Featuring Logrite & Woodchuck tools - made in the U.S.A.
Logrite & Woodchuck tools are the best log handling tools available. The aluminum handles of Logrite cant hooks, peaveys, and other tools are lighter and strong than wood-handled tools. Every Logrite or Woodchuck cant hook, peavey, or hookaroon is made right here in the USA. The most important of all log handling tools, the cant hook helps to roll logs over and position them for cutting and yarding. With two opposing hooks, cant hooks grab and hold logs better than peaveys. The longer the handle, the larger the log you can maneuver. The bright blue aluminum handle is stronger and lighter than wooden handles. Comes with either 48” or 60” handle. Similar to a cant hook, the Peavey has a point on the end instead of a hook to help pry logs apart. The point can also be stuck in the ground, enabling the peavey to be used as a visual marker to aim at while felling trees. The bright blue aluminum handle is stronger and lighter than wooden handles. Originally designed to help position floating logs to form a raft, the hookaroon is a back saving tool for pulling firewood out of the back of a truck. Rather than standing in the bed grabbing rounds at your feet, stand upright on the ground and pull them out with the hookaroon. The 36” handle enables you to grab those pieces stuck behind the tire wells from either side of the bed. The bright blue aluminum handle is stronger and lighter than wooden handles. The log stand is an invaluable firewood cutting tool that connects to either the cant hook or peavey. By getting the log off the ground, a round can be cleanly sliced off the end without danger of dulling the chain in the dirt. Also helps to reduce the potential for chainsaw kickback. 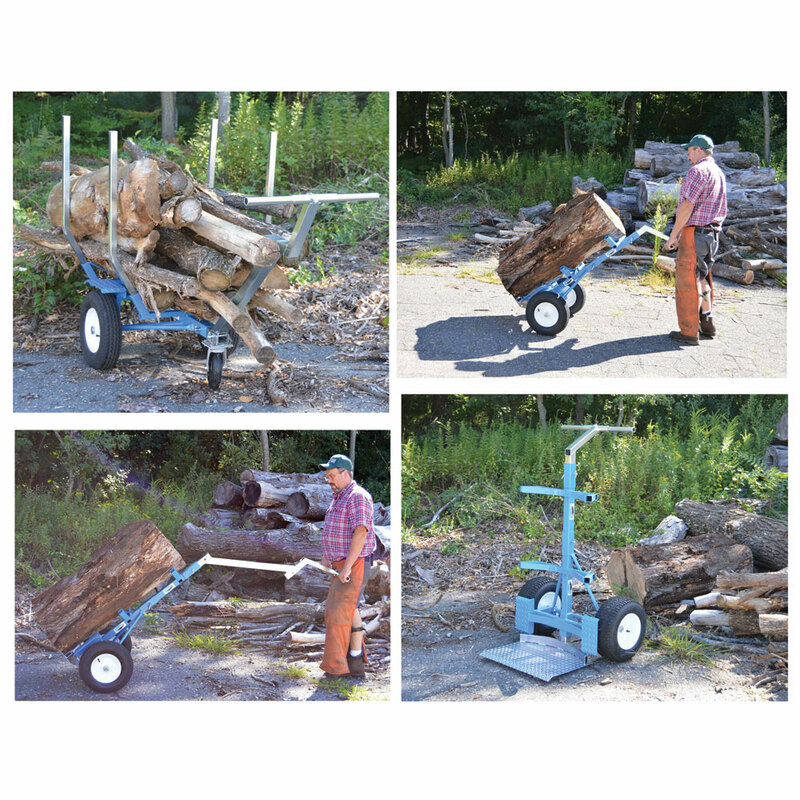 The log carrier is a two person tool for skidding logs by hand. The 54” handle enables each person to walk comfortably without running into the log. The bright blue aluminum handle is stronger and lighter than wooden handles. This all-in-one hauler can be converted from heavy-duty hand truck to brush cart and back. The hand truck's ergonomic handle system allows you to lift logs, barrels or anything large and bulky easily and comfortably. As a brush cart, it features 1500 lb load limit and 46 cubic feet of space. No tools are needed to convert the hand truck into the brush cart. Just pull the 4 hitch pins to convert or to break it down to fit into your truck tool box or trunk. The unit is so compact it can ship by ground carriers to your door. And the best part - both the hand truck and brush hauler fit through a 36 inch gate! Oversized item - extra shipping will apply. In the continental US, flat-rate shipping of $35 will apply; for Hawaii/Alaska or International shipping rates, please contact us for an exact quote. This is a special-order item. If out of stock, please allow an extra 5-10 days for delivery. The Logrite Junior log arch is capable of moving logs from 4”to 16”in diameter up to 1000 lb. and can freely suspend logs up to 16'. By attaching the arch just beyond midpoint of the log, the entire log weight is placed on the wheels, making moving and turning easy to do. 33”extension handle is available to add reach for use on longer logs. Oversized item, extra shipping will apply. This item ships directly from the manufacturer. Replacement foam grip for peavey, cant hook or hookaroon handles. Mesh tarp made of woven UV resistant PVC-coated polyester. Six handles make it great for loading up and transporting brush. Works will for lightweight to rugged materials and handles great even in extreme conditions. Resists water, mildew, and rot, excellent durability.